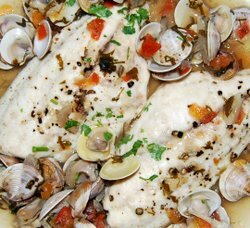 Seafood Stew from the Mediterranean - Superb Dorado Flavours - the Best Recipe. We've refined this yummy Seafood Stew recipe over the years until we now feel that it's just about perfect. It's really simple to make and doesn't use a huge number of ingredients. For the fish fillet part we have used Gilthead, a delicious white fleshed Fish which is widely available around the Mediterranean. It's known as Dourade in France, Orato in Italy and Dorado in Spain. All the names reflecting the Golden colour around its Head. For the Shellfish we chose clams, almejas here in Spain, vongole in Italy and haricot de mer (Sea Beans) in the South of France. You can follow this recipe to the letter and you will have a wonderfull Seafood Stew, or change anything you fancy - everyone has slightly different tastes and preferences. Another delicious Mediterranean Diet recipe. 8 Smallish Fillets of Gilthead (any good firm white fish will do). Skinned. 500g. About 1lb. of fresh clams. 2 or 3 Good Shallots or one small onion finely sliced. 2 Cayenne peppers or chillis crumbled. 1 pint - 2 cups of dry white wine. 1 Bunch of coriander chopped (it's up to you but we like a lot). 2 plum tomatoes - diced. Cornflour to thicken the sauce. First of all poach your fish fillets in the white wine with a pinch of salt, in a non stick fry pan. Drain them and keep them warm. Now - add the shallots, garlic, chillis, lemon juice (and a little of the rind, finely sliced if you like) and most of the coriander (keep some back to sprinkle at the end). Then reduce the liquid by half. Add the tomatoes and bring back to the boil. Add the clams and stir until they have all opened. Now slake a spoonfull of Cornflour (corn starch) in some cold water and add it little by little until you achieve the desired consistency. It should be quite runny but not watery. Place the fish fillets on four plates - spoon over the saucy clams - sprinkle over the remaining coriander and serve straight away. 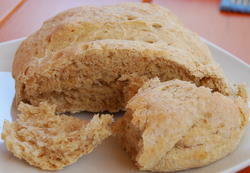 Great with our Brown Bread Recipe.